This year’s Emmy Awards saw the return of crowd favourites, such as Modern Family, Game of Thrones and the critically acclaimed Breaking Bad. Though the end of Breaking Bad will leave a hole in our hearts, the latest TV newcomer, True Detective, showed it could be the next big hit, taking home five Emmy wins after its first season. If you haven’t already jumped on the bandwagon of these four brilliant shows, here’s a recap of what you’re missing out on. Comedy series Modern Family once again proved itself to be two steps ahead of the rest after its fifth win for Outstanding Comedy Series. The story follows Jay Pritchett, the head of a big and unconventional family, which includes Jay’s second wife Gloria, his two adult children (Claire and Mitchell) and their respective families. This year’s Emmy Awards saw Modern Family win Outstanding Directing for a Comedy Series and Outstanding Supporting Actor in a Comedy Series awarded to Ty Burrell. 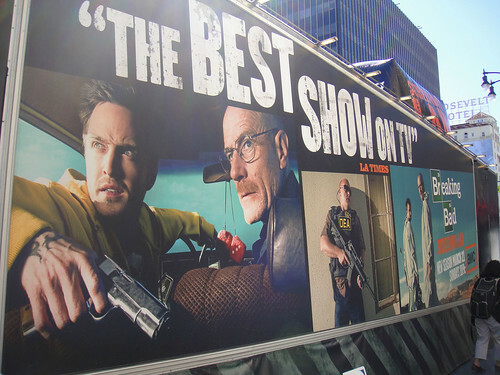 2013 marked the final season of Breaking Bad and at the 2014 Emmys, the show went out in style, with an amazing six Emmys, including Outstanding Drama Series. When a high school science teacher, Walter White (Brian Cranston, Outstanding Lead Actor in a Drama Series), finds out he has terminal cancer and no money to pay for treatment, he turns to former student, Jesse Pinkman (Aaron Paul, Outstanding Supporting Actor in a Drama Series), to help him cook and sell crystal meth. His struggle to provide enough money for his family after he dies leads him deeper and deeper into the vicious drug world. Keeping up its growing history of excellence, Game of Thrones returned for its fourth year for another four awards. Set in a fantasy world, Game of Thrones follows the political struggles of ruling families, all vying for a chance to take the Iron Throne. While war rages in the south of the land, a dark and terrible force awakens in the frozen north, ready to sweep across the land. Across the sea, three dragons, thought to be extinct, hatch with the help of the last true heir to the Iron Throne. This year saw Game of Thrones win in what it does best. Awarded Outstanding Special and Visual Effects, Outstanding Costumes for a Series, Outstanding Art Direction for a Contemporary or Fantasy Series and Outstanding Prosthetic Makeup. With Breaking Bad coming to a close, True Detective has stood up to take its place as the next big crime drama. Awarded fiveEmmys in just its first season, True Detective has a bright future ahead. Two homicide detectives, Martin Hart and Rustin Cohle, hunt for a serial killer in Louisiana for over seventeen years after coming across the ritualistic murder of a prostitute in 1995. Click here to get season one of True Detective on DVD or Blu-ray. Among its awards were Outstanding Main Title Design, Outstanding Cinematography for a Single Camera Series and Outstanding Directing for a Drama Series. What other Emmy award-winning shows are you looking forward to watching? Leave a comment below to share your answer.